There’s a reason that building toys like Lego, Imaginext and even Lincoln Logs are so popular with kids (and even adults): building stuff is awesome. Plick is a building toy that lets your imagination run totally wild. The robotic parts that make up the play set are connected via elastic wiring that lets them attach to everyday objects. 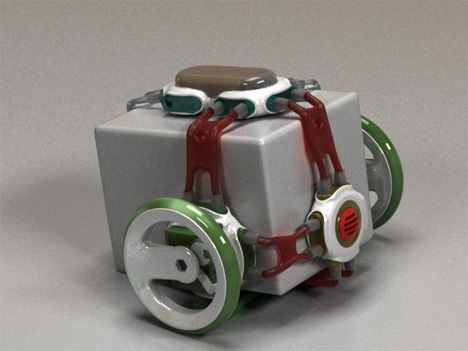 In the picture above, a selection of Plick parts are attached to a box to make a roving robotic vehicle. The Plick parts include a motor, a battery pack, a sound sensor, distance sensor, and LED lamp. The flexible wiring, according to creator Gabriel Paciornik, was the most challenging part of the design to work out and is also one of the most important aspects of the Plick concept. You don’t have to be an engineer or even very good with building to make something totally amazing with this set. You only have to snap together a few parts and see what happens. 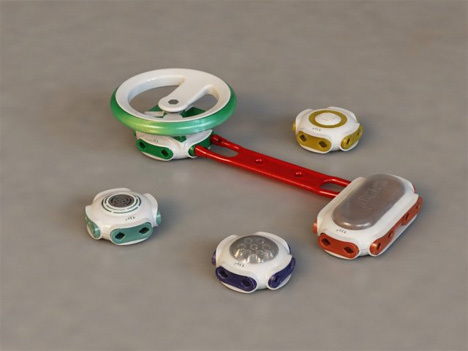 Plick was Paciornik’s final project in his Industrial Design college program, and he took great pains to come up with a product that would be fun, appealing and usable to kids. His research definitely wasn’t wasted because we’d run out and buy one of these today if they were available to buy. Paciornik doesn’t say what kind of grade he got for the project, but we give him an A. See more in Robotics or under Technology. July, 2011.